Heritage Toronto’s Historical Plaques Program Coordinator Camille Bégin said this yesterday alongside Historica Canada’s Hayley Andrew, the Canadian Museum of History’s Jenny Ellison, and the Ontario Ministry of Indigenous Relations and Reconciliation’s Alison Norman during the “Doing it in Public: History Outside the Academy” roundtable. I think the sentiment can go both ways. Wrapping up my first PhD year, I am around many students who, as historians, have little interest in engaging, discussing, and respecting the public audience. History, for them, does not mean interacting with contemporary publics online, in print, or within gallery spaces. It means talking to colleagues within their institution and publishing for those at other universities, keeping academic history within the walls of those who are understood as competent enough to “get” it. Having worked at a variety of archives, libraries, and museums over the last few years, connecting and conversing with publics is, for me, what it is all about. I am constantly frustrated at the answers when I question what the point of doing history is if not for other people. With Ellison discussing how publics in the histories we study are respected in ways absent to how we sometimes deal with contemporary audiences, a push “to respect the public, not just educate the public” is therefore imperative. How are we supposed to be relevant historians if we refuse to do so? Such discussions supplemented the collaborative “New Technologies in Historical Research” roundtable earlier that morning to insist that those doing history are sometimes not historians at all. Listening to Peter Baskerville, Dominique Clément, Ian Milligan, Reuben Rose-Redwood, Samantha Romano, and Sonja Aagesen, I was happy to hear about current interdisciplinary projects that greatly respected the skills and tools offered by people who may be geographers or computer scientists that are nevertheless doing history all the same. Working together within the academy alongside historians to build digital tools and data sets useful for the history that we do and the publics that we want to reach offers unheard of opportunity to work with the material at hand. Approaching the next few years of dissertation work will, perhaps, be a solitary process for me if it is kept within the expected confines of academic practice. That there is some element of public engagement and collaboration within the academy beyond intense study, however, offers hope to the historian like me who wants their work to do something more than speak to itself. I look forward to hearing how we continue to do so in Regina, Vancouver, and London. Sometimes it seems like it is really tough to be anything but an angry historian. A lot of us read, research, and write about gut-wrenching histories, which may be made even more so when we hold personal connections to the stories that we tell. Sometimes we cannot help but be frustrated by a museum stuck in antiquated practices. Other times, it takes what seems like unheard of patience to engage with hard-headed publics and professionals when our work gets political. It seems that the work that we do as historians often gives us little recourse apart from mobilizing the past in an attempt to satiate our anger at present circumstance. First thing Monday morning, however, Histoire Engagée’s Mathieu Arsenault warned a CHA panel on “Historians and Advocacy” against Histoire enragée. Alongside David Dean, Sarah Nickel, and chair Gregory Kealey—who read an absent Natalie Zemon Davis’ contribution—here was a room full of historians frustrated by attempts of depoliticization and administrative barriers that remained devoted to figuring out how to use their platforms within the academy for better practices both inside and outside of it. Tenured professors encouraged their peers in the room of a felt responsibility to speak out and speak up for those still developing their careers, putting themselves on the line in an era of contract precariousness for up-and-coming academics. It was a refreshing example of professional solidarity and responsibility that has an important place in the conversations of social media discussed in yesterday’s post. Later that afternoon in a standing-room only lecture hall set to discuss urban education, indigenous youth, and the Truth and Reconciliation Commission’s Calls to Action at “Remembering Our Past: Rethinking the Next 150 Years and Beyond,” we heard anger, heart-break, and frustration. But it was not that histoire enragée Arsenault cautioned against earlier. Rather, it was resilient, engaged, and at work. Anger at the realities discussed by Kevin Lamoureux’s experience as an educator in Winnipeg’s North End was palpable. But this was also a room full of glee, chuckling at his banter with Frank Deer. And, with Catherine Tammaro creating a welcoming community space, it was safe. Here I was at one of the most difficult sessions to witness as an audience member at Congress 2017. And I, among the rest of those in the room, found myself laughing. This led me back to the “Decolonizing 1867” workshop on Sunday night. In reflecting on Helen Knott’s work as artist, student, and mother, she displayed a fierceness in activism and anger as well as one in friendship and love. She pointed to displays of both joy and frustration throughout current and past indigenous processes of colonization and decolonization in this country. Here was a display of sentiment multiplicity and complication, finding benefits in the operationalization of both. Yesterday, two panelists on the “Collecting and Exhibiting Childhoods: Museums, Archives, and the History of Children and Youth” roundtable discussed their respective professional experience with the Canadian Museum for Human Rights. Expressing frustration over past museum practice and current barriers to timely applications of self-critical museology regarding indigenous histories in particular, both agreed that the museum’s forward-thinking in all things accessibility was one space where their advocacy was unnecessary because it was already embedded in that institution’s museological practice. The reasons why and the answers to how our given activisms as historians make us go into an archive, into the media, or into a community offer examples through the power of anger at injustice both within and beyond our own personal attachments. So, of course, stay angry about the things that need to be changed until they are, as encouraged by Guy Laforest during yesterday’s AGM. But let’s not forget the power of the things that we can also achieve by sharing stories of resilience, laughter, and learning that focus on the good of the work that we do and the spectacular that we find in the histories that we disseminate. It will not negate the hard histories that we tell. But it will give them nuance, humanize historical actors, and make its conversation with the present an active, informed, and hopeful one. I am Facebook Friends with Dave Bidini. In 2015, with Stephen Harper up for re-election, I worked with him and a bunch of other musicians, artists, and supporters who were trending #ImagineOct20th. Together, people were curating and organizing concerts across the country to get Canadians to imagine the day after the election when someone else won the seat of federal power. I do not say this to brag about my CanCon arts links or my left-leaning politics. To be honest, the social media connection is not a huge feat. Bidini is, in fact, approaching 5000 Facebook Friends and has over 3000 Followers. I say this because it seemed particularly relevant to me during yesterday afternoon’s History and Social Media roundtable. What I have gained from networking with artists like Bidini is an activist arts presence in my life that I desire to see in other historians’ social media presence beyond published journal articles and textbooks. Featuring Daniel Ross, Jessica DeWitt, Adam Gaudry, Andrea Eidinger, Alexandre Turgeon, and Sarah York-Bertram, the session moderated by Sean Kheraj and supported by ActiveHistory.ca did more than suggest preferred platforms and a shared love of Twitter analytics. Rather, I have not been able to forget DeWitt’s responses since it wrapped up. Being adamant that a social media presence ought not to be separate from the person behind the medium is, I think, a powerful and impressive stance for her to take. A degree of professionalism is, of course, important to the way historians engage with their online publics. But that has to be balanced with engaging content from an interesting expert that can reach those both within the field and outside of it. If we only appear as historians facing the public—in effect, hiding the multiplicity of our individual identity—does this not dehumanize and detach us from the world that we live in? We also exist in an era of evermore precarious employment. As discussed yesterday, graduate students in history departments fear a poorly worded, irrelevant, or too political Tweet could spell their ruin in the academy. And it is a fair concern. In the national arts community, this remains a common sentiment. And it seems to be ever applicable to the young historian seeking to carve their way in an academy that has increasingly limited opportunities within it. So some of us are creating our own path by using the accessible tools that social media offers. Looking to those in the arts, we can learn from the ways that musicians, photographers, and other creatives balance the benefits of exposure and fair pay for their labour. Graduate students tweeting, blogging, and generating online content for “exposure” ought to look to these examples for solace, alliance, and development that exceeds the expectations and limits of the academy. I further will venture to say that no historian worth their salt is *only* a historian. Those within and beyond the Canadian Historical Association are, of course, people with a passion and a talent for history. But they are also more than that. The things that make us different from our colleagues ought to therefore find applicable value to combining variety with our field’s shared methods to reach a more diverse output. I am a historian who has worked in media, museums, and behind musician merch tables. These experiences do not make me any less of a historian. Rather, I am confident in saying that they actually probably make me a better historian. And I, for one, do not think that any of us should be hiding who we are under the guise of a perhaps outdated genre of expected professional development trajectories that the academy no longer provides. For weeks, I have been anticipating the opening of the Canadian Historical Association’s (CHA) annual conference because it meant that “Decolonizing 1867: Stories from the People” would be here. Organized by Stacy Nation-Knapper and Kathryn Magee Labelle and supported by the LR Wilson Institute for Canadian History at McMaster University, this event brought together artist Catherine Tammaro, Dr. Brittany Luby, graduate student Naomi Recollet, poet Helen Knott, doctoral student Jesse Thistle, and Dr. Carolyn Podruchny in a Ryerson University classroom to discuss how to approach the discussions we are and need to be having surrounding Canada 150 beyond some sort of celebratory remembrance of Confederation. I am sure that my first few hours of the CHA were similar to others experiencing, like me, their first Congress. Colleagues from other institutions kindly introduce themselves simply because you happen to sit beside them. You see former co-workers, panel mates, or current classmates, seeking a quick catch-up over the days, months, or years that have passed since you last saw each other. And you jump in to the learning that can be gained from an impromptu car ride, coffee run, or shared train ride home, prepping yourself to do it all again the next day. And the next day. And the day after that. But when organizer instructions ask you to form a circle in the lecture hall, eat catered food, and listen to the presenters before being invited yourself to join into the conversation as audience member, something feels different. This is not what I have been told to expect from a conference session. What happened last night was a session of learning, multidisciplinarity, and indigeneity. In displays of emotion and creativity, the discussion went from activist stance to treaty study through painting and poetry as well as linguistics and history, all meeting in a space of resistance and resilience. This was all taken in and informed, I think, by Labelle’s invitation to “be brave and contribute to the conversation” given at the session’s outset. Among many takeaways, it was an echo of Labelle’s direction that remained with me as Knott introduced herself as an “accidental activist” needing to “resist or be run over” before blowing the crowd away with her words. It stuck with me while I listened to the implications of Luby’s captivating grammatical reading of Treaty 3. And I hope that it continues to stay forefront in my mind through the next three days of panel, lecture, and workshop attendance that I have in front of me. Focused as I intend to be on seeking out sessions discussing the ways art and culture intersect with public history practice and the conversations we need to be having regarding Canada 150 both within and beyond the academy, perhaps this start ought to be heeded as a call to do the CHA differently. The Last Day and still lots to see! The last day of a conference always seems a little sad to me since it’s a day to say last good-byes while still catching all the panels and activities possible. My first panel was The Stories Staples Tell; Resource Economies in Canada with Colin Coates (York University), Jim Clifford (University of Saskatchewan), Andrew Watson (University of Saskatchewan), and Anne Dance (Memorial University). The panel began with a discussion of how the staples thesis has been set out and what new digital history techniques can add to this area. Coates showed how text mining can help to show previously overlooked staple products or unnoticed distribution trends. The use of digital history techniques enables large numbers of documents to be examined and analyzed in different ways. Coates gave an example of a Wordle analysis of Innis’ classic work which showed an emphasis on fish, fur, and wheat. He also explained the Trading Consequences site and closed the presentation with the suggestion that this type of research can propose new stories of economic activity. Since the staples thesis has become so widely known – a classic – I was excited by the idea of re-examining it in this way and the idea that a more micro-level approach might yield new insights. Up next were Jim Clifford and Andrew Watson who used the Trading Consequences site in their own work on London’s Ghost Acres which uses a MediaWiki and examines how commodities production in other places supported and fed the city of London. Canadian cheese, for example, dominated the overall cheese imports to Britain. As it’s a big project with lots of potential commodities to examine Watson suggested that they would be interested in collaborative work. A blog on the NiCHE site about this will be coming soon! Anne Dance brought the panel into more contemporary times with a look at the last three decades of dealing with contaminated sites in Canada. She suggest looking at the Federal Contaminated Sites Inventory to get an idea of the scale of the issue but also provided a map of the sites – there were a lot of points on it! Her work uses a lot of grey literature and government reports. Since my own project also uses a lot of similar literature it was great to hear it discussed within another context and to get another perspective on its uses and limitations. Dance noted that the next part of the project will be to look at the same topic with a “bottom up” approach. The reclamation approaches initially took a southern approach to northern sites which meant that solutions, such as the importation of fresh topsoil, were impractical. The shift to more northern-focused solutions has created jobs in reclamation and a new spin on the idea of contaminated sites; remediation is now portrayed less as fixing failure and more as economic development and investment in the future. With the rise in the remediation industry could this, Dance mused, become a new part of the staples story? After this panel I decided to go to the poster exhibit. It was great to see the posters from many different historians show-casing such a wide range of topics from emotional labour in community engaged research to representations of Western Canadian identity on menus (aptly put behind the coffee the CHA office was offering). The posters for me were a way to get a quick snapshot of research. Sadly I didn’t come across many of the poster presenters to ask questions but next year I’ll make sure to attend the presentation session so I can do just that. I’ve tweeted photos of all the posters if you’re curious about them. Next up I headed to the Expo where I spent an enjoyable time browsing through the books on offer. I always have trouble deciding on which books to buy when I have only a little room in my suitcase for them. Fortunately I was able to get books shipped to my home which made the decisions easier especially when some of the books I wanted were available only for pre-order. I presented in the afternoon. Shout out to the audience members for showing up at the last panel of a very busy day! My panel was Sustaining a Fragile West: Environmental Myths and Realities will Claire Campbell (Bucknell University) and Frances Reilly (University of Saskatchewan). I enjoyed having a chance to share my own research with an audience and to see the presentations from my fellow panel members. Reilly presented on the Alberta Rat Patrol and how its early messaging echoed messaging around the fear of communist encroachment. Campbell looked at the Bar U Ranch and how its history is celebrated without putting ranching into its context as an extractive industry. My own presentation focused on the changes in the nitrogen balance and soil fertility of the Saskatchewan RM of Wise Creek which was part of the international Sustainable Farm Systems Project. With the panels done and the CHA officially finished it was time to take the evening to enjoy Calgary. A friend took me to the Inglewood Bird Sanctuary where I was delighted to see geese, deer, and swallows. As we walked across a bridge we came face to nose with a porcupine! After mutual and careful observation we both decided to return the way we’d come. The porcupine sighting was a delightful end to my Calgary Congress and CHA experience. I want to thank the CHA Graduate Students’ Committee for giving me this chance to share my experiences at the CHA with all of you. I hope you enjoyed Congress as much as I did. Une journée plus tard et de retour chez moi, voici ma dernière contribution à ce blog concernant le Congrès et SHC. L’aventure a certes été au rendez-vous. Ma dernière journée au Congrès et à la réunion du SHC a été plus courte que les autres journées. J’ai dû prendre l’avion tôt dans l’après-midi afin de pouvoir prendre le transit de l’aéroport jusque chez moi. Cela dit, j’ai manqué la première session à 8h30 car mon alarme n’a pas sonné (à moins que je ne l’ai pas entendue). J’ai donc seulement réussi à me rendre à un panel qui me semblait très intéressant. Le panel «La narration du passé visuel » ne toucha pas nécessairement à mon projet de recherche mais présentait un concept et des idées concernant la façon dont les historiens et les historiens d’art utilise leurs sources comme évidence. Erin Morton nous a présenter le cas d’un artiste dit folk et de l’utilisation, et la façon dont les pièces de cet artiste ont été placé dans un musée afin de créer une sorte d’histoire du Canada et un récit qui raconte l’histoire des pionniers au Canada. Susan Cahill présenta son projet d’art visuel en ligne ou elle espère pouvoir obtenir, éventuellement, la participation du public qui créerait des récits et la narration de ces pièces d’arts visuels après les évènements du 11 Septembre 2001. La surveillance, dans ce contexte, est un modèle heuristique qui peut être utilisé pour encadrer le projet. Continuant dans le monde virtuel, John Bonnett présenta les applications possibles du monde des jeux vidéos et de la cartographie GIS afin de créer un récit plus complexe avec une narration alternative. La convergence de plusieurs catégories analytiques peut être utilisé pour présenter la narration de façon cohésive tout en maintenant l’hétérogénéité de la population en question. Par exemple, Bonnett démontre que nous pouvons inscrire à chaque édifice sur une carte en trois dimension, l’ethnicité de tous les résidents et ensuite, nous pouvons y inscrire, par une autre couleur, la class socio-économique des résidents. Ce processus pourrait continuer avec plusieurs autres catégories. L’ajout de chaque catégorie change et présente la variabilité dans le récit. Le panel termina avec une longue période de questions ouvertes, ce qui m’a permis de voir et d’écouter les questions de l’audience surtout en ce qui concerne la façon dont nous utilisons les textes comme source primordial d’évidence en histoire et qu’en histoire de l’art, le visuel est présenté comme source d’évidence plus légitime que le texte. La discussion passa donc plusieurs minutes sur le sujet afin de conclure que les deux sont utiles et doivent être utilisés en conjonction l’un avec l’autre. Après la session, ce fût un trajet rapide à l’aéroport pour mon retour à Waterloo. Heureusement, j’ai pu suivre les présentations suivantes, surtout celles concernant l’enseignement de l’histoire après le rapport du CVR, sur Twitter #CHASHC2016. Une réflexion sur mon temps au Congrès et au SHC en particulier m’a aidé à voir que ce que je pensais ressortir le plus du Congrès, soit les présentations, n’était qu’une petite partie de mon aventure. Les discussions après les présentations, des fois au restaurant ou au pub, et les rencontres que j’ai pu faire avec d’autres personnes qui sont sincèrement merveilleux et intéressés dans les mêmes projets que moi m’ont donné plus que des connections, mais des amis. J’ai fait le parcours du Congrès et j’ai eu des moments que je n’oublierai jamais. Une amie et moi sommes partis à la recherche de la statue d’Hippocrate dans la faculté de médecine afin d’y prendre une photo pour une amie et nous avions eu toute une aventure qui inclus une course frénétique dans la pluie que je dirais presque torrentielle et une série de photos à un village historique. Tout considéré, malgré le fait que certains panels ont été réorganisés, la réunion de la SHC et de la SCHM furent décidemment de grands succès et j’ai hâte à l’année prochaine lorsque le Congrès sera à Toronto à Ryerson. Today I was feeling comfortable on the U of C campus – the signs were familiar and I could landmark from the statues that are scattered around the campus. The first panel I chose was one of which looked interesting but wasn’t related to my area. Canadian Children’s Television History: Nationalism, Regulation, and the Formation of Canadian Identities made me curious because I had enjoyed a presentation at another conference on the NFB film Ti-Jean Goes West and how it represented region and children in Canada so I wanted to see more work about Canadian media. I also admit to being hopeful that as a media history panel there would be some clips for childhood cartoons. It did not disappoint! Prior to the panel beginning they played the theme from The Racoons to get the audience in the proper mood. Katherine Rollwagen (Vancouver Island) looked at how Canadians thought of television when it was first being introduced into Canada by looking at the Fowler Commission. There was a concern making sure Canadian content would be played and that it would be educational for young viewers. 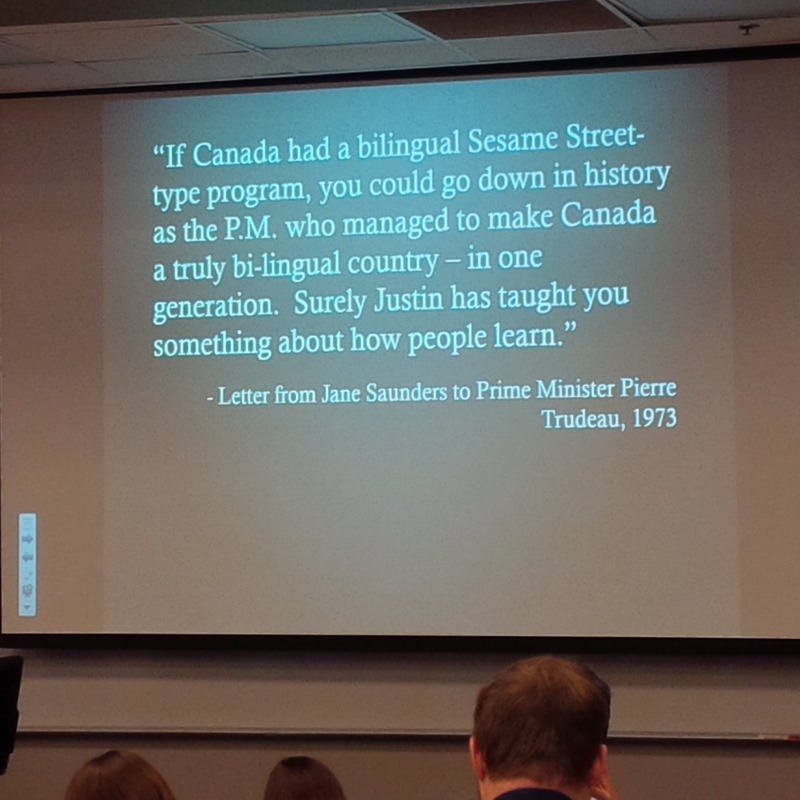 Matthew Hayday (University of Guelph) looked at the battle to keep Sesame Street as part of regular television programming when the CRTC ruled that it did not count toward Canadian content. He showed a letter from one mother to Prime Minister Pierre Trudeau that appealed to him as a fellow parent. A letter to Prime Minister Pierre Trudeau. After this panel I hoped the C-Train to downtown Calgary – a quick and easy 15 minute ride. 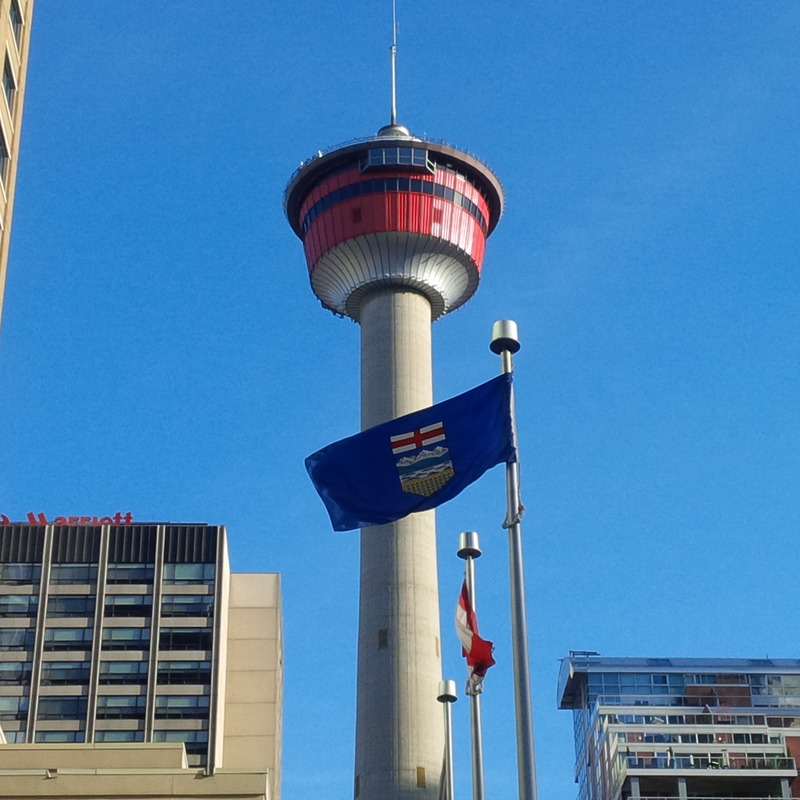 At Centre Street I saw the Calgary Tower and found my way to the Glenbow. Prior to getting to the CHA I had signed up for the CHA Aboriginal Studies Group organized tour of the Glenwbow museum. When I first saw the email I was immediately enthusiastic about doing the tour because it promised a tour of the backrooms and, as a friend of mine who works in museums told me, the backrooms always have the best things. The first part of the tour was led by Sheldon First Rider, a Blackfoot educator, who took us through the Niitsitapiisini: Our Way of Life exhibit and told us his personal journey as a member of the Blood Tribe. It was an honour to hear his story. It seemed to me that many people were thinking about what we had just seen and heard as we headed to lunch. The spicy butternut squash soup and complimentary buffet provided the tour with an opportunity to reflect and to take time to chat informally with each other. The first stop after lunch was the Archives and Library at the Glenbow where we saw the shelves holding thousands of photo negatives in the archives collection, and learned about the collection’s focus on the area directly around Calgary. The oldest book in the library is a manual on treating horses, reflecting the interests of the Glenbow’s founder Eric Harvie whose collecting started the library and museum collections. Afterward we rode the elevator to the archives floor where we were met by the curator who had pulled several artifacts from the Glenbow’s collection of Indigenous artifacts. One of them was a carved stone bison which was shortly to be going on tour. We were lucky to see it since it is a piece that tours often. We were also shown masks, treaty medals, and a coat made from seal intestine, to name just a few. 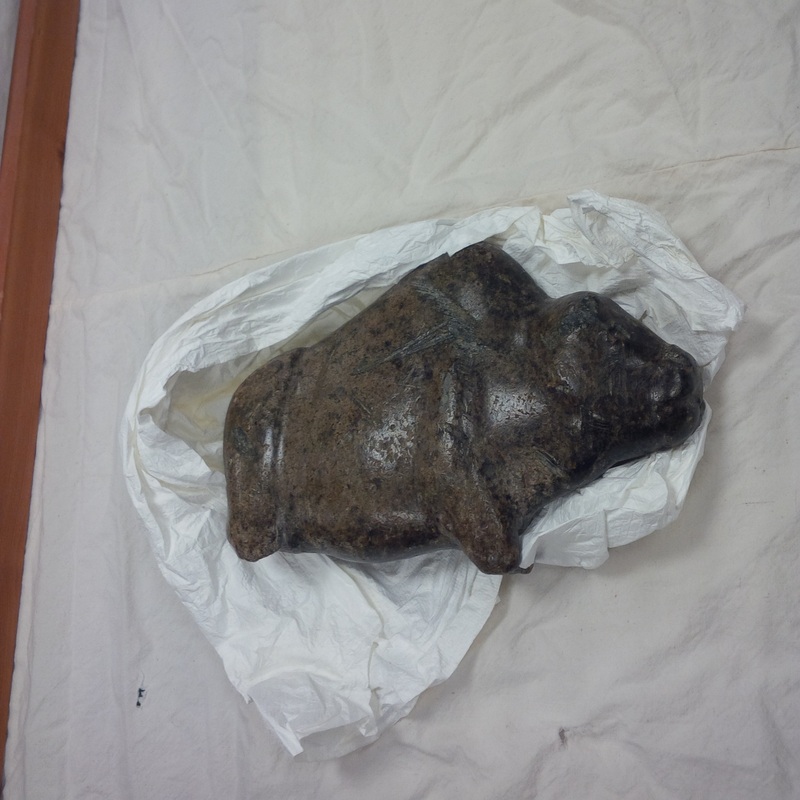 As part of our viewing of the collection items we also heard about the Glenbow’s protocols for working with Indigenous peoples to repatriate artifacts and collaborate with them in terms how items are collected, stored, and displayed. The tour ran long but it was one of those tours that you don’t want to end since amazing pieces continued to be revealed. The last was a car hidden by a piece of sheeting. It turned out to be the car from Michael Nicoll Yahgulanaas’ Pedal to the Meddle art piece. But all good things must end and we emerged into the lobby of the Glenbow as the afternoon was waning. With only a couple hours before Cliopalooza began I decided to enjoy what downtown Calgary offered. In my wandering I found a lovely walking path by the river and managed to spy not just the usual ducks enjoying the water but a beaver as well. The statues that dot the downtown made useful landmarks and after investigation one of those statues turned out to be pictured on the front of the front cover of my CHA program guide. Cliopalooza was held in the Legion 1 building where the CCF was first founded in 1932. Naturally as somebody with an interest in both grain and agrarian politics this was my first stop on arriving at Cliopalooza. The evening was a great way to run into old friends who I’d missed seeing at the day’s events and the dance floor was full of historians.